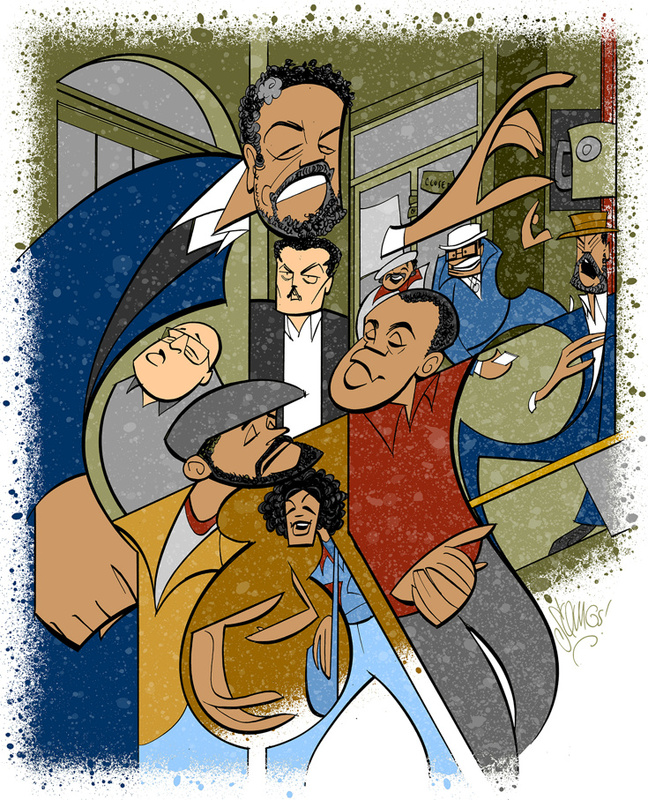 After premiering in 1982, August Wilson’s Jitney is finally on Broadway. The new production, directed by Ruben Santiago-Hudson, opens officially on January 19 at Manhattan Theatre Club’s Samuel J. Friedman Theatre. To commemorate the big night, Broadway.com resident artist Justin “Squigs” Robertson penned this sketch of the cast in action. The whole crew’s here: featured in the portrait are John Douglas Thompson as Becker, André Holland as Youngblood, Harvy Blanks as Shealy, Anthony Chisholm as Fielding, Brandon J. Dirden as Booster, Carra Patterson as Rena, Michael Potts as Turnbo, Keith Randolph Smith as Doub and Ray Anthony Thomas as Philmore. Congratulations to the cast of Jitney! We hope you don’t have to drive yourself to your fancy opening night party.